When journalists do a story on a subject, it is best to go look at what those in the know tell you is important. So the day after talking to Cleveland city councilman Martin Keane, who serves as vice chair on the city's transportation committee, I found myself wandering around Voinovich Park at the end of East Ninth Street. 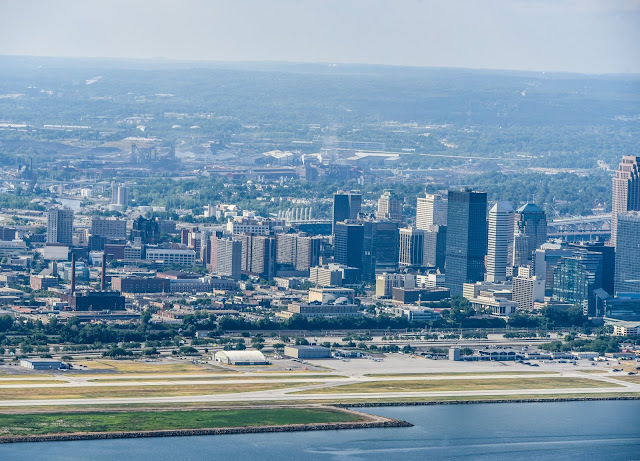 The question for Keane the night before was why the city of Cleveland keeps Burke Lakefront Airport open even as the number of flights it services has dropped off a cliff, declining more than 60 percent since 2000. It's a question many others are asking too. Why does the city need an airport on prime downtown, lakefront property when it's not used by many planes? It's part of the broader conversation on Cleveland's over-supply of tarmacs. Northeast Ohio's other two airports — the Cuyahoga County-run airport in Richmond Heights, and Cleveland Hopkins — have also seen declines, which isn't surprising: These airports were planned to serve a need when Cleveland had lots of people. Cleveland doesn't have lots of people any longer, so the need simply isn't there. "We have three airports in this county and really only need two," Cleveland attorney and longtime Cleveland City Planning Commission head Tony Coyne told Scene. "Since we have to keep Hopkins because of the airlines, it comes down to county and Burke. One of them is no longer needed. We have to figure out which one should go." And yet the city hasn't done a study recently on the pros and cons of keeping Burke open or closing it. Why not? Councilman Keane said that Burke is an "asset" as an airport, and that if I wondered whether it should be closed and developed in some other way, I should check out the new lakefront development over near Voinovich Park, behind the Rock & Roll Hall of Fame, for evidence it should not. "Burke is a tremendous asset as an airport," Keane said. "I think the biggest study going on right now is the waterfront development around the dock, north of the [FirstEnergy] Stadium and in Voinovich Park. Burke serves its purpose as an airport, and the success of the development we have [at the waterfront development around the stadium] is a good story." So I went down and wandered around for an hour or two as I was instructed to do. Two new development buildings are at the end of East Ninth Street. Harbor Verandas, behind the Rock Hall, is under construction and will possibly be open before the end of the year. It will be a three-story, 16-unit apartment complex, with 1,700 square-foot, two-bedroom units renting for about $3,700 a month. The other building is already done: a modern Mexican restaurant, which was nearly empty for lunch on a drizzly Tuesday. The city opened up these projects for bid about five years ago. And the next phases — doing a similar mix of housing and office and retail on the old port acreage north of FirstEnergy Stadium — are likely more years out from putting shovel to ground. The height restrictions from being next to an airport are again holding things up. Still, they are nice little projects that might move Cleveland's wandering development eye toward the lake, as the populace seems to want. But you cannot think of lakefront development in Cleveland and not think of this 450-acre airport as the hole in the donut of future planning. While wandering around in the drizzle on this Tuesday in March, not one plane took off or landed in the two hours I was there. I thought of how people wanting to live in a $3,700 a month apartment overlooking Lake Erie might want a big park nearby. Or stores to shop at. Or offices. Or a place to work. Or a bench on a trail where you can bring your binoculars to look at birds, or catch the sunset over the water. Or all of that. How big is Burke? Think of it this way: You could drop Cedar Point on it and still have 90 acres left over. It could accommodate two golf courses. How many thousands of people could live there depends simply on how many you wanted to live there. Some urban planners and city officials have said closing Burke should not even be considered until other projects are completed, which is a silly excuse, because it really has nothing to do with the question itself, and the process is not a short one. This is about whether or not it might be a good time to decide whether to get moving on long-term planning on something that will likely take 20 years. Lots of information here has been misrepresented by politicians, the development community and the private airplane industry for years, for their own purposes, and we will get into that. But while I was looking around Voinovich Park and waiting for a plane to emerge from the fog, I thought about what longtime Cleveland urban planning expert Hunter Morrison had told me a few days before. "One of the biggest challenges Cleveland faces," Morrison said, "is that it has to resize its oversized infrastructure. What to do with Burke airport is a part of that challenge." Cleveland city councilman Kerry McCormack said the same thing in a different way. "There is no doubt about the fact that we should look at whether we need to keep Burke open as an airport or not," he said. "Go down to Edgewater Park on a weekend. People now love to be near the water and we don't need to speculate on that. This huge amount of property downtown has the ability to be recreated into a variety of uses that can be very diverse. "I don't think any city in this country has this much property that they own along a waterway like this," McCormack said. "The least we can do is see what our options are." Dan Brady is the current president of the Cuyahoga County Council. He was a three-term Cleveland city council member (1986 to 1996), and also served as a special advisor to mayor Frank Jackson to develop a strategic business plan for Cleveland Public Power, on the lake just east of Burke. He too is perplexed about why the future of Burke is not considered as its numbers go so far down. "We use to discuss its future somewhat when I was on [city] council, but that is not being done now and I have no idea why it is not," Brady tells Scene. "[Burke] can be lots of things — park property, housing offices, a city planner's dream — and having that type of property on the lakefront is something other cities don't have." "I don't want to speak for the mayor, but from my perception the mayor is not open to conversation about this," Brady says. "But it is in our best interest to be doing studies now to prepare for when [closing] does happen." To get at the crux of the Burke issue is to first look at the data and facts of what it once was and what it is now. The plan for a Cleveland lakefront airport was first announced in 1927, part of a trend to capitalize on this newfangled aerospace business. Airplanes were the new toys of the rich, and Cleveland had plenty of those. Charles Lindbergh had done his first solo crossing of the Atlantic that year, and many cities — especially in the Northeast and Midwest — thought they would need as many airports as possible to compete in the transportation game. Hopkins was already opened at this time, and doing big business. When considering a downtown airport, Cleveland had an express purpose in putting it next to the lake: The new airport would "cater primarily to amphibious plane operations and will have all the facilities for sea plane and hydroplane operations," the city stated in its Cleveland Region Airport Plan in 1946. The airport opened in 1947. The irony was that the notion of sea plane popularity and usage was mostly gone just about the time Burke opened up. Landing planes on lakes was popular and, for the military, useful during World Wars I and II; but after the war, it faded from view as the airport industry found sea planes generally limited in use to delivering mail in Alaska. Cleveland, always tragically behind the curve on trends ... . But we digress. In order to accommodate sea planes, Cleveland's downtown airport was built on mostly clean fill dumped in the lake, meaning it was a combination of building and highway construction excavation from the period. Some dredging from the Cuyahoga River and Lake Erie was also used. A garbage dump occupied about 20 to 30 acres of the airport on the far northeast portion of the property until it closed in the late 1950s. The Ohio EPA found in 1987 that the dump area posed a "low threat" for land or surface water contamination and would not be considered for any "remedial action" list of properties that had hazardous materials problems. "The perception that Burke is built on a garbage dump and cannot be used for anything else is a public misperception that refuses to go away," says Ted Esborn, a Cleveland attorney who worked in the city's law and health department in the '80s and '90s. "The EPA has never found this to be a superfund site, and to the extent they built the terminal and a high school on it, it is obvious you would be able to build other structures on it as well." Ohio EPA spokesman James Lee told Scene that the Ohio EPA "is not aware of any additional sampling or studies at this property" that would indicate any environmental issues from the landfill, and that the state agency "is eager and available to work with the city, if assistance is needed." The other misperception of the airport is that Burke is a net economic benefit for the city. According to the Federal Aviation Administration's Air Traffic Activity Data Base System (ATADS), Burke had 100,321 takeoffs and landings in 2000. By 2010, that number was down to 53,987. Last year, 2017, it had basically dropped off to 38,571. So between 2000 and 2017, Burke's flight numbers have dropped by 62 percent. Those are striking numbers made even more striking by this fact: About a third of those 38,571 takeoffs and landings are for the pilot flight schools located at Burke, which has nothing to do with business, travel or shipping of goods. During that same time period, Hopkins and the Cuyahoga County Airport in Richmond Heights also saw significant declines. According to ATADS, Hopkins had 331,899 operations in 2000 and 122,392 in 2017. The Cuyahoga County Airport dropped from 65,177 to 20,106 in that same period. To put it another way, the three airports in Cuyahoga County had 497,397 takeoffs and landings in 2000 and 181,069 in 2017. That means 361,328 fewer planes landed in this area last year than in 2000, so the argument that Burke is needed as a "reliever" airport for Hopkins for when it gets too busy — a guffaw-inducing excuse Frank Jackson has trotted out time and time again — is a strange interpretation of basic numbers. One more small, but relevant, number has changed as well. The location of Burke Lakefront Airport in downtown Cleveland might have had some time advantages in 1970, when the city population was 750,000 and about double what it is now. Less population means less traffic, and the downtown airport has less advantages on the time scale than it once did. Driving time from Burke to Public Square is eight minutes, but from Hopkins to Public Square is only 17 minutes. The car time from Burke to the Cleveland Clinic's main campus near University Circle is 16 minutes, while Hopkins to the Cleveland Clinic comes in at 20 minutes. This is not to diminish the advantages of short travel times. Sitting in a car for several hours instead of several minutes can be a difference maker. But that is not the case here. The differences are in minutes. Which brings us to the last point. One of the excuses used by Burke proponents is that University Hospitals and the Cleveland Clinic use Burke for the transportation of organs for transplant purposes. It is implied that patients will die if Burke is closed, because the organs will not be transplantable if the travel is too long between their surgical recovery and placing them in the bodies of the living. A big problem with that argument? Organs last somewhere between four and 24 hours after recovery, depending on which ones you're talking about, and the difference in travel time between Hopkins, Burke and the County airport to UH or the Cleveland Clinic is about eight minutes. And speaking of transplants, there was some speculation that Cleveland might offer up Burke to get Amazon to move their secondary headquarters here. That speculation was preposterous on so many levels. The biggest problem is that in order to give Amazon the 450-acre Burke property as their new relocation campus space, the airport would have to be closed first by the Federal Aviation Administration. The FAA does close airports, but it often takes many years to do so. Would Amazon jump in as Cleveland's new economic partner — and cast aside the other cities to do so ­— if the land Cleveland was offering was not available until the feds said it was cool? I think we all know the answer to that. "The FAA won't let you close the airport, so why bother trying." It's been said for decades when talking about Burke, an adage trotted out by naysayers and politicians. "Give me a break; that is a loser attitude," said Robert Simons, an urban planning professor at Cleveland State University. "The attitude is that we have way too much development, so why try? Most every city in the country would be excited about having space like this, but people in Cleveland refuse to get excited about this? That is pathetic." Simons' view is echoed often, but only privately. It's why the vast majority of Cleveland — be they council members, hospital nurses, pothole fillers, lawyers or media members — all trot out the same reason Burke can never close: "We can't do it because the FAA won't let us." That has a little bit of truth to it, but the key word is "little." "The first thing that happens when cities request that their airport be closed is that the FAA says no," says Ronald Price, the principal with QED Consultants, a Florida-based aviation consulting business that advises cities and counties on their aviation business, including how to close up airports if that is good for the local government. Price's company worked for the city of St. Clair, Missouri, which got the FAA to close its city-owned airport last November. 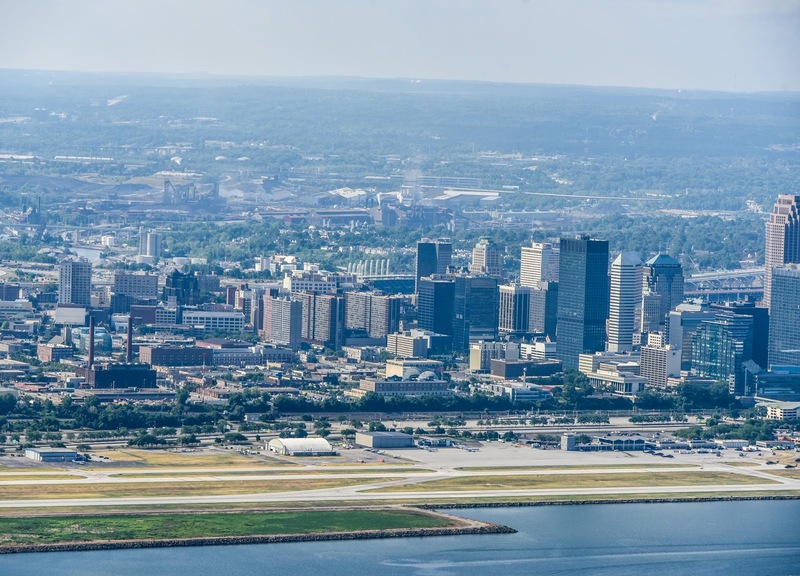 That airport, which had fewer flights than Burke, is about 50 miles west of St. Louis, and the city thought the 150 acres along Interstate 44 could be more useful for development than for the occasional plane. So about 10 years ago, they started to explore closing. "After the FAA told them no, the city of St. Clair did research, on how the flights had declined, the way they could use the land economically better, how much the airport was costing the city, and why closing it would not affect other airports nearby adversely," Price says. "Sounds like Burke airport a bit, doesn't it?" Price said that after they prepared their research, the FAA said, "Maybe." The St. Clair mayor and council then asked Missouri politicians — the governor, the two U.S. senators, and U.S. House members — to get on board. Backroom talks between Congress, the city and the FAA then put the closing of the airport in play, and Sen. Claire McCaskill introduced a bill in 2014 "to release the city of St. Clair from all restrictions, conditions and limitations on the use, encumbrance, conveyance and closure of the St. Clair Regional Airport." That bill, passed by both House and Senate, was signed by Pres. Barack Obama in 2014. The airport closed for good in November 2017. A similar type of closing occurred at Blue Ash Airport 16 miles northeast of downtown Cincinnati in 2012. The 250-acre airport opened in 1921 and had seen its aviation usage decline over time. The airport was owned by the city of Cincinnati, and it sold half of the airport to the suburb of Blue Ash for a park and the rest to private developers for housing and other projects. The airport traffic there was absorbed at other local airports in the Cincinnati area. "It is not easy to get the FAA to approve airport closures," says Peter Kirsch, a Washington, D.C., lawyer specializing in aviation law and policy. "But if Cleveland wants to, it can more than likely prove that Burke costs too much money to remain open, has better economic use, and that the flight operations can be handled elsewhere." "And remember," Kirsch says, "the FAA does what Congress tells it to do. So if the Ohio delegation expresses to the FAA it wants Burke closed, things start to move. But it has to start with the mayor of Cleveland. Nothing gets done unless he wants to get things started." Two hurdles: Airports get grants from the FAA, and as part of the acceptance of those grant, the airport owner (in this case the city of Cleveland), usually agrees to stay open for 20 years after the last grant was received, and to pay back those grants to the FAA if the airport does close. The FAA says it has given Burke about $23 million since 1982, including some grants last year. Does that mean Burke cannot close until 2037 and Cleveland has to pay $23 million to do so? The answer is murky, but certainly not set in stone. The first part is that the grants are amortized, meaning the amount owed for a $10 million grant from 2010 will be less than for a $10 million grant from 2017. Most think the $23 million in grants to Burke are really worth about $10 to $15 million, and given that Burke costs the city about $1.5 to $2 million to operate annually, some think the FAA grant money payment is actually a way to save money in the long run. As far as not being able to close until 2037: If Cleveland starts now, that can be negotiated by Congress, and the 20 years is, more often than not, a starting point from which the FAA can move downward. Of the dozens of airports closed by the FAA in the past few decades, none took 20 years to go from the point of seeking permission to the point of closure. More often than not, the period was in the seven to 10 year range. Congress can take care of those things, as Missouri's McCaskill did for St. Clair. "The case for the FAA to permit the city of Cleveland to close Burke is much stronger than any of the recent closures because of lack of use," said Robert Poole, director of transportation policy at Reason. "That is very obvious. The ability to absorb those flights at other airports, and the market value of the reuse of those 450 acres, would be a good mix that the FAA would have a hard time saying no to. And even if the FAA wanted all $23 million from the grants they gave to Burke, the sale of parts of those 450 acres for private development would dwarf what they would have to pay back to the FAA." Poole also said to look at Santa Monica Airport in California: It's recently announced closure is proof that closing a big city urban airport is something the FAA is now open to. The Santa Monica Airport is less than 10 miles from Los Angeles International Airport and, between them, those two had almost five times as much air traffic last year (777,000) as Burke and Hopkins had (160,000). Santa Monica has been working on closing the airport for about 10 years, and in 2017 the FAA agreed to let them do so, effective in 2028. The reasoning? The city thought the 250 acres would be better for the city as a park, and that the neighboring glut of airports in Southern California could easily handle the flights. "This is a historic day for Santa Monica," Santa Monica mayor Ted Winterer said in the announcement about a year ago. "After decades of work to secure the health and safety of our neighborhoods, we have regained local control of airport land. We now have certainty that the airport will close forever and future generations of Santa Monicans will have a great park." In 2014, Cleveland mayor Frank Jackson was asked by former city council member Zack Reed about whether the city might want to close Burke for lakefront real estate development. His answer? "There are between 75,000 and 80,000 landings and takeoffs at Burke every year ... alternative use for redevelopment at this time is not realistic." There was a big problem with Jackson's comments. And not for whether Burke is well suited for "alternative use for redevelopment" either. Burke hadn't had 75,000 to 80,000 takeoffs and landings since 2005. In reality, Burke had 54,000 flights in 2013. (And that number could easily be absorbed by Hopkins and the county airport, experts say.) He was 30 percent off. Nothing against Mayor Jackson on this. It's how people are. If you have no intention of considering closing an airport like Burke, no consideration that maybe 450 acres of prime lakefront property in downtown Cleveland might be a city game changer if done right, then there is no reason to have the latest facts correct. Because the facts really don't matter. Cleveland attorney Richard Knoth shakes his head at how the city of Cleveland has handled this issue. As a former port authority board member, Knoth has been studying Burke's land use for more than a decade, and he is surprised the city has been able to bury the closing of Burke as an issue for so long. "The flights have been declining for almost 20 years and no one thinks that is relevant?" Knoth asked. "There is not a long-term approach to leadership in this city, and that really explains why this asset is so underutilized. The FAA could not contest this, because the numbers for closing it are there. To think otherwise is to ignore the facts." In the long run, the main issue here is whether the city should do a study to lay out the pros and cons of closing versus keeping the airport open. In the past, the city has tended to pay for studies that predict future growth and to keep Burke open. In 1999, a study predicted Burke would have 132,000 flights by 2017. Another study in 2007 said Burke would have 90,000 flight by 2016, even though the numbers had fallen between 2000 and 2006. Both studies suggested the city would need more hangers and new runways to keep up with the big growth, and that closing Burke would mean the region would lose $81 million in economic impact because of the closure. Longtime Cleveland State University urban planning professor Norm Krumholz sees it differently now. "I don't think there is any question that this is a good location for development, although either the mayor's position or the FAA position is likely enough to keep it open as an airport," he told Scene. "But what is reasonable is to do an economic analysis of the comparative benefits of it remaining an airport or closing it and building on it. It is very reasonable to request to have that done at this time. And that includes the cost of each, the estimated cost of redevelopment versus the cost of maintaining it. And then a political decision can be made. That request is not only reasonable, it is necessary on this subject right now." Ohio State University professor Ned Hill sees things the same way. "We might find out there are problems with building on some part of the 450 acres, and no problems on other parts," he said. "We might find out that there are some national real estate developers who think this is a great investment. And we might find out there is little market for a mixed-use development in Cleveland right now, and that a big park is all it could be. But we don't know what the answers to all those questions are until we look at them in a smart and open-minded way." That open-minded attitude is all that most are asking for right now. Burke does have a small passenger service that flies a small number of passengers to Cincinnati each week, and it might be good to know if that passenger service has a growth potential that makes it worthwhile. One the other side of the coin, the city needs to quit lying about how important Burke is to the city economy. For example, Cleveland officials said Burke was going to draw extra flights into Cleveland during the Republican National Convention, the World Series, and the three NBA Finals. But the numbers say the opposite: The flights into Burke were fewer during those specials events than they were in the same months in previous years. At the very least, Mayor Jackson can be honest, solicit a comprehensive study, and then, as Krumholz says, make a political decision based on the results. In the meantime, professor Hill has a suggestion. "I say we should just close it on our own and build a Scottish links golf course," he says. "We can play golf while the FAA sorts it all out. Might be the best way to handle this."